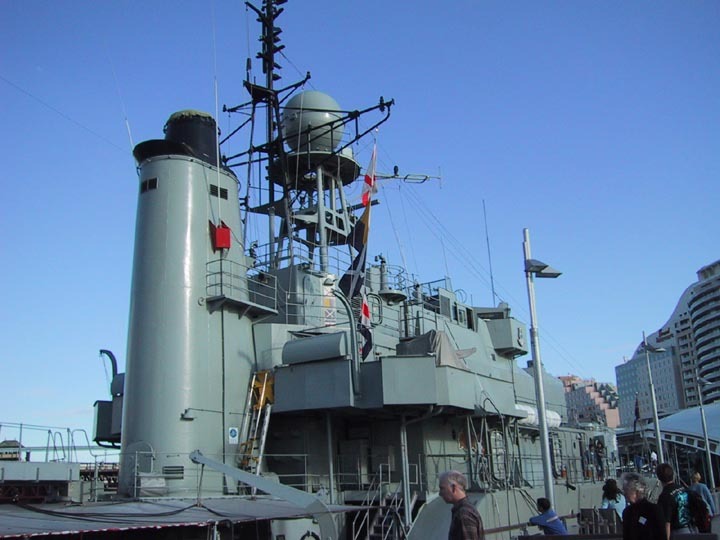 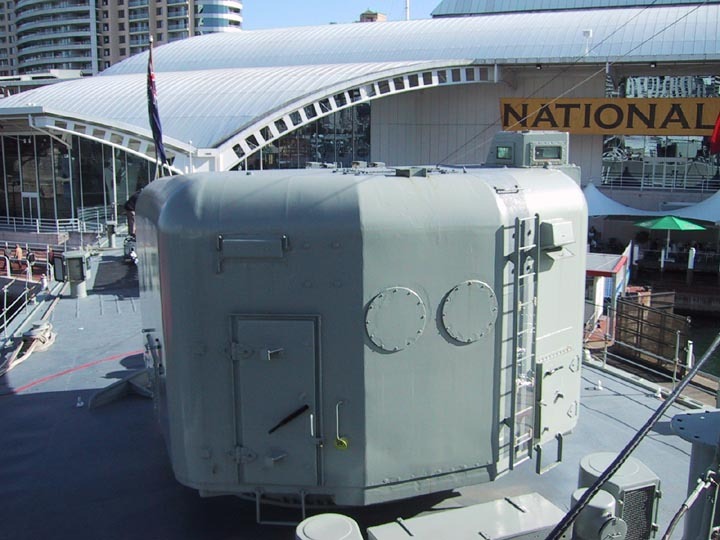 The HMAS Vampire (known as "The Bat") is the last of the Royal Australian Navy's conventional gun boats. It was designed to provide all-purpose fleet defense against surface, sub-surface and air attacks. It served in the British Commonwealth Strategic Reserve in the 60s and 70s and was converted to a training vessel in 1980. 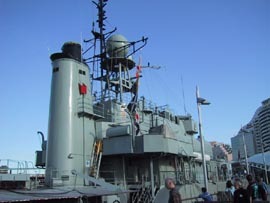 She was decommissioned in 1986. Dockside view of the bow of Vampire. 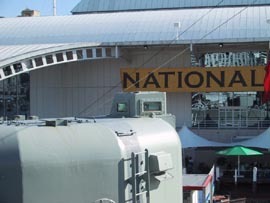 Its main armament are three turrets mounting a pair of 4.5 inch cannon each. One of a pair of dual 40mm Bofors anti-aircraft cannon mounts. The forward superstructure has the wheelhouse and bridge on top, control centre underneath. 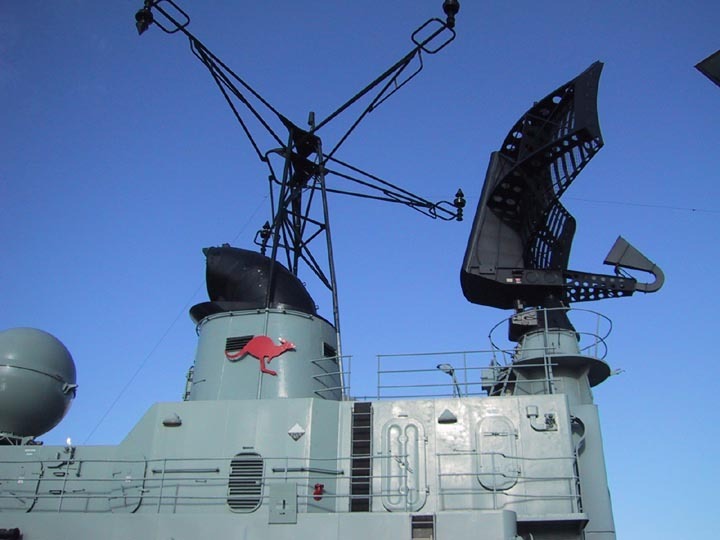 Fire control radar was retrofitted in the 1970s, but that couldn't save Vampire from retirement - she was just to manual and mechanical for a modern navy. 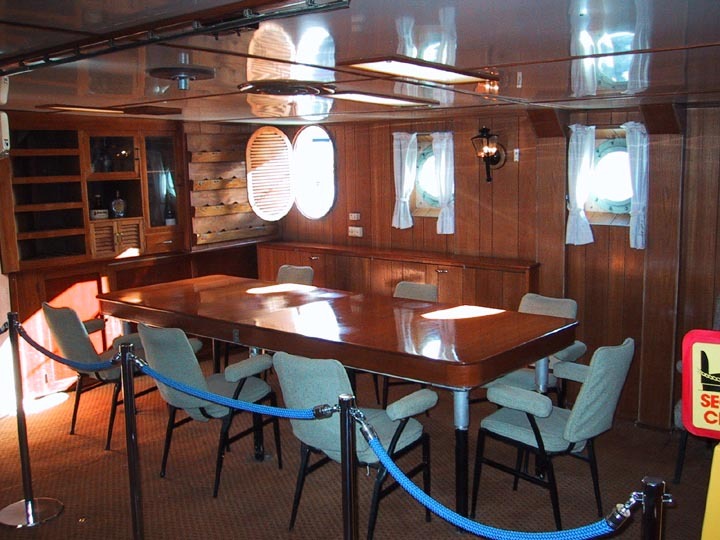 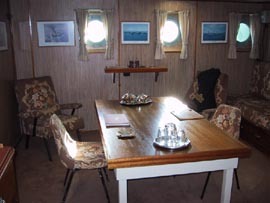 The starboard side crew mess - there's a mirror image on the port side to the right of this photo. 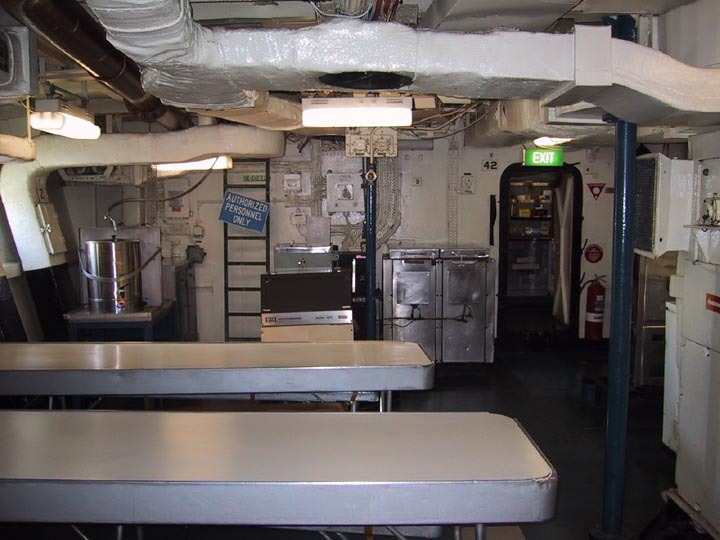 Just aft of the port side mess is the kitchen, this size is over the kitchen service counter. 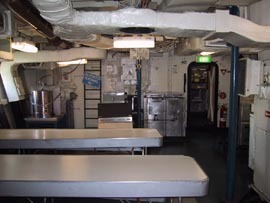 Captain's mess, forward of the crew mess. Officer's mess, on the other side of the ship from the Captain's mess. 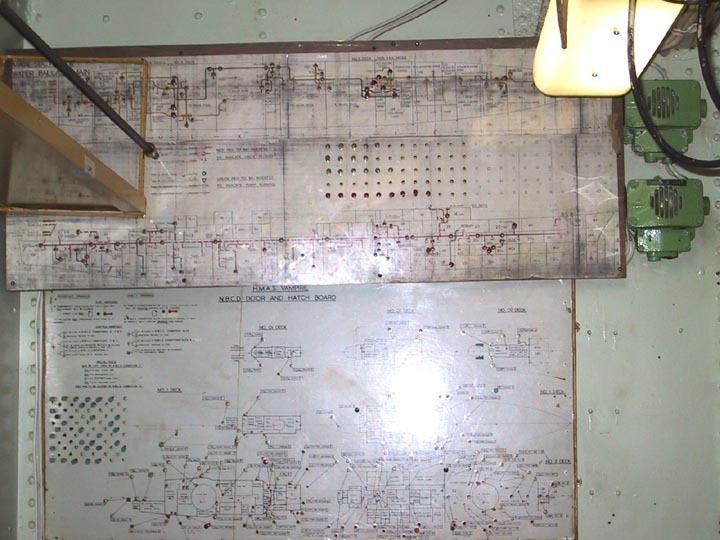 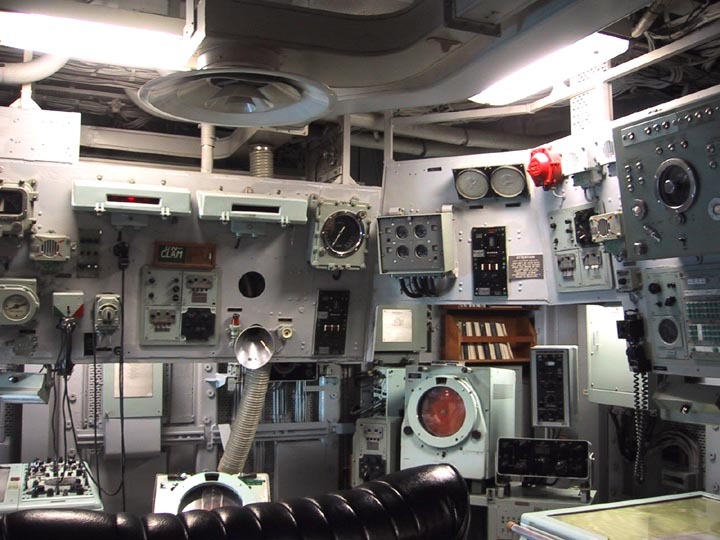 Aft of the kitchen is the damage control panel, showing lights for every water-tight hatch and the ability to mark damage throughout the ship. Near the damage control center is the radio room, which is still used periodically like a HAM radio station. 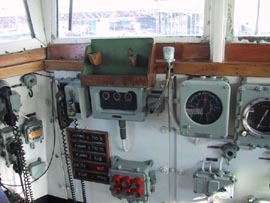 The wheelhouse contains three important components - the wheel, the telegraph (to send speed commands to the engine room) and the gyrocompass. Stacy climbs the ladder to the bridge. The bridge, also known as the compass room, filled primarily with instruments for navigation - war fighting was done from the control room below. 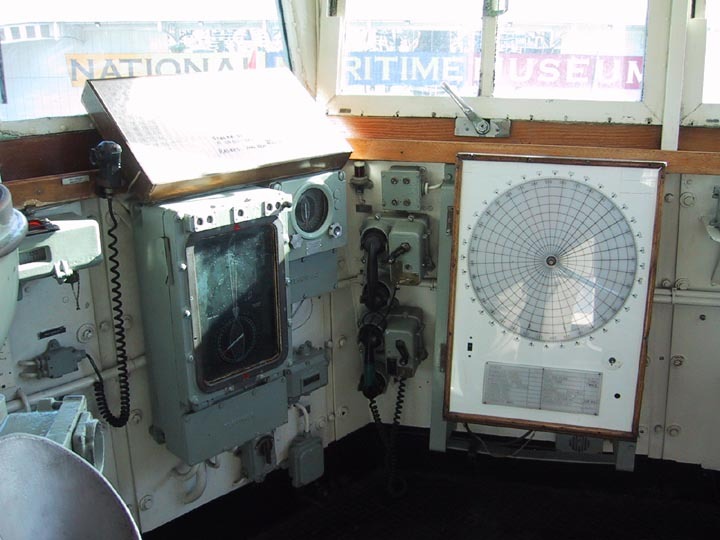 Navigation radar and direction finding equipment on the bridge. 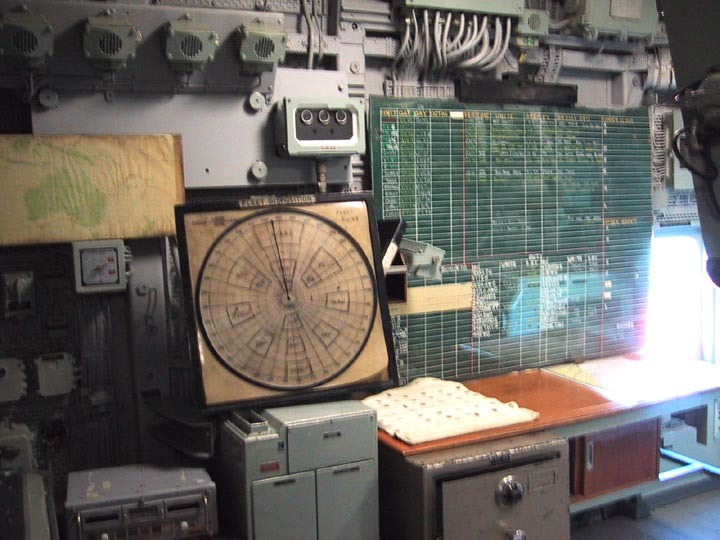 Down in the control room, this is the surface plotting and direction station. 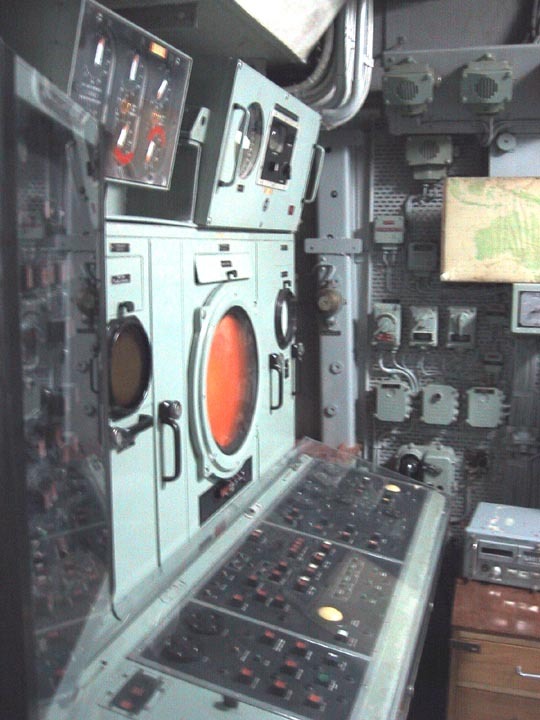 Anti-submarine warfare station. 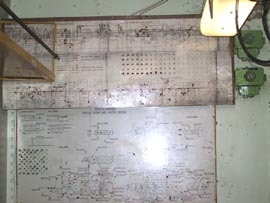 To the right is the chart table. Radar control station in the control room of the Vampire. Back on deck, all the way forward are the anchors. 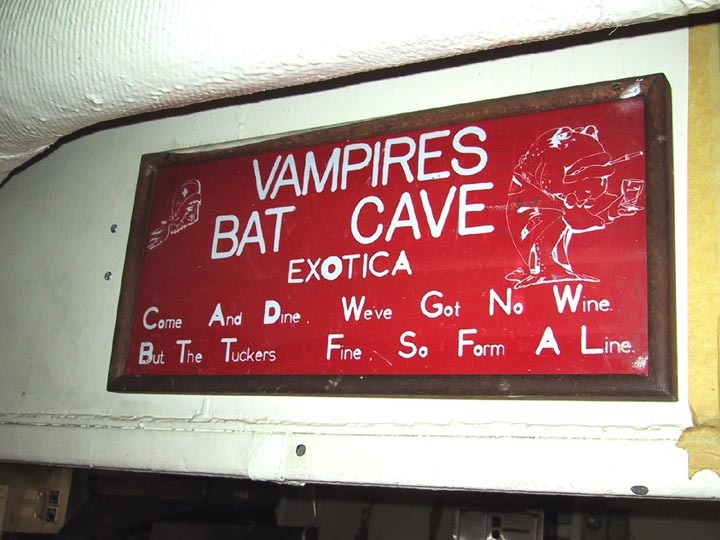 Time to look at the primary purpose of the Vampire - the main guns. 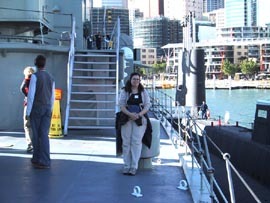 Stacy leans against a ventilator unit, right beside the A gun. 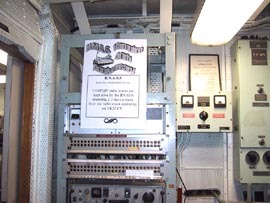 Behind the A Gun, on the B Gun deck. 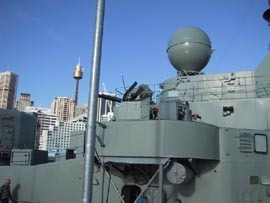 A close up of the A gun view port - the gun controller could aim and order fired the gun from inside the turret. 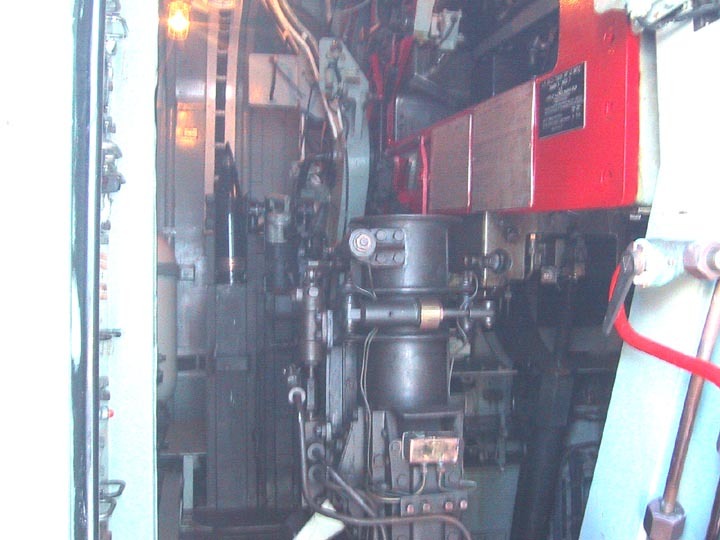 A look at the loading gear inside the B gun turret. 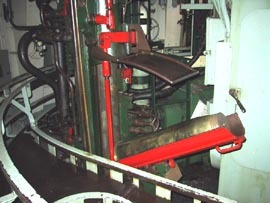 You can see in the center the automated hoist for lifting cartridges to the gun. 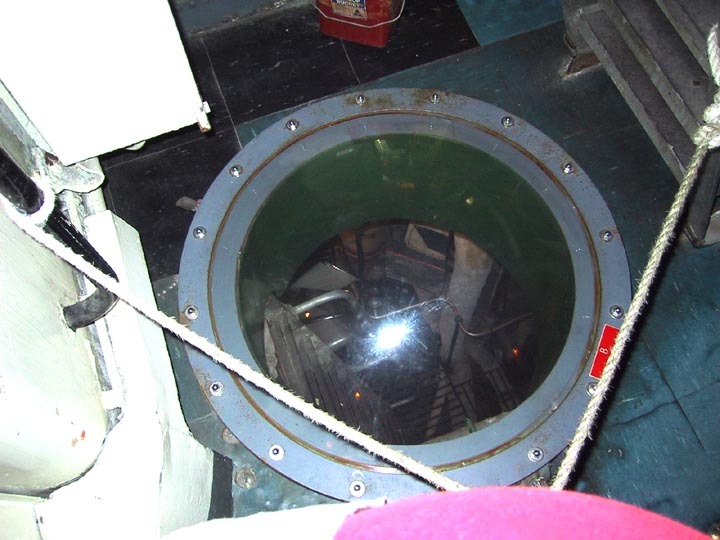 From there, they would be man-handled into the chamber of the gun. 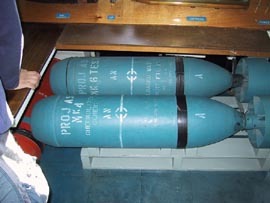 4.5 inch cartridge casings, combined with a primer, powder, shell and fuse make a weapon capable of hitting targets 19km away from the ship. 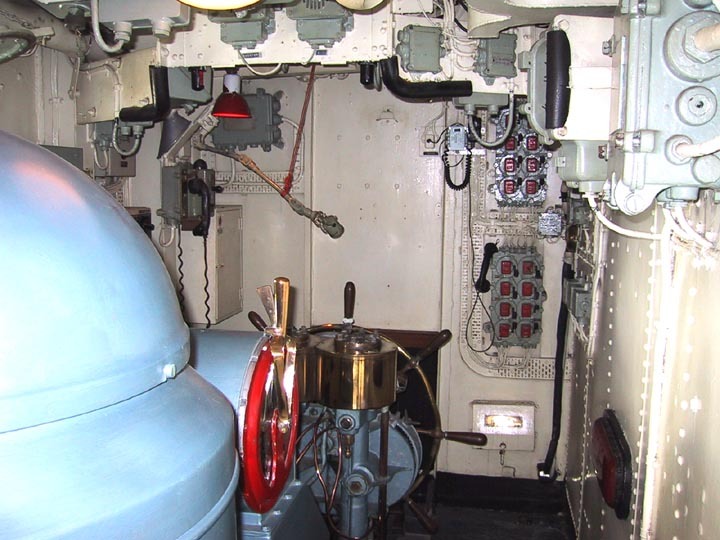 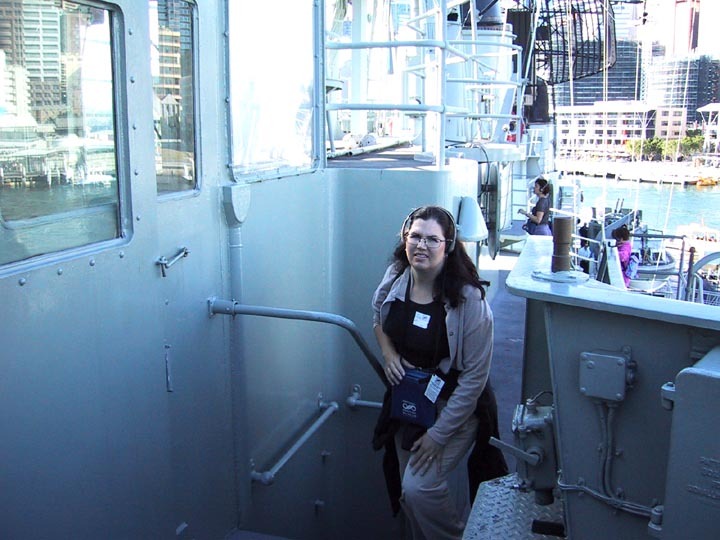 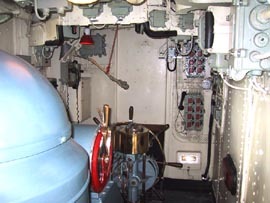 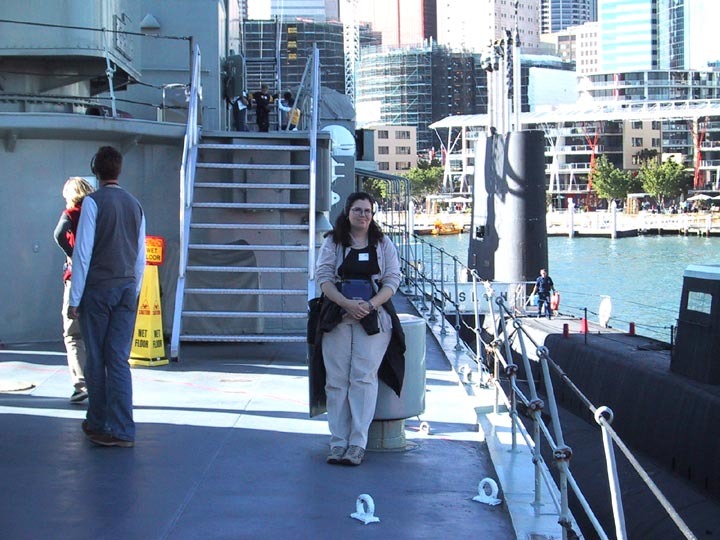 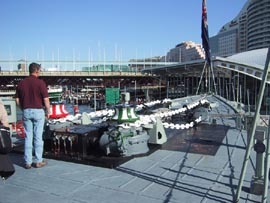 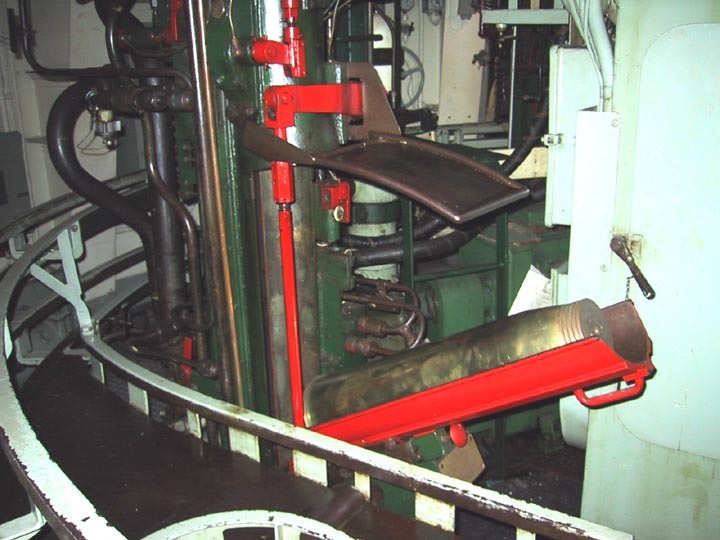 Down in the lower decks, below the turret is the automatic hoist for the cartridges. 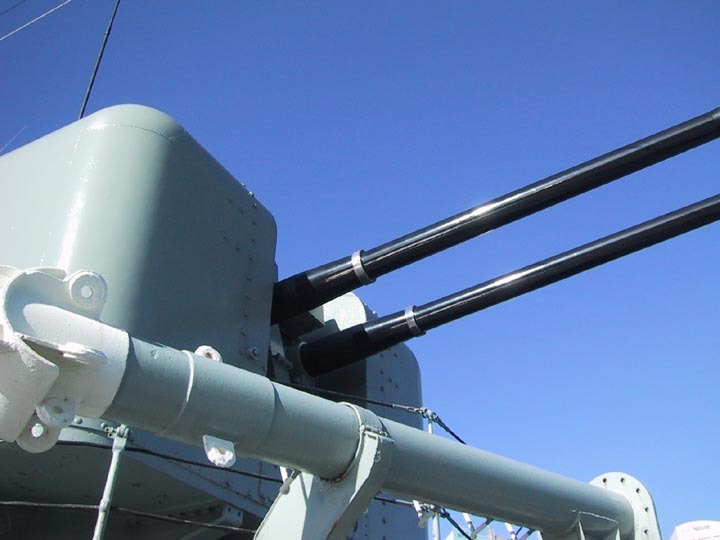 There are two cartridge loaders per turret - one for each barrel of the gun. 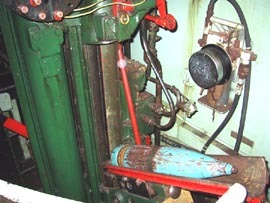 A shell sitting in the automatic loader of the A gun, two decks below the turret itself. This shell weighs 75 pounds and traveled at 2,500 feet per second when fired. 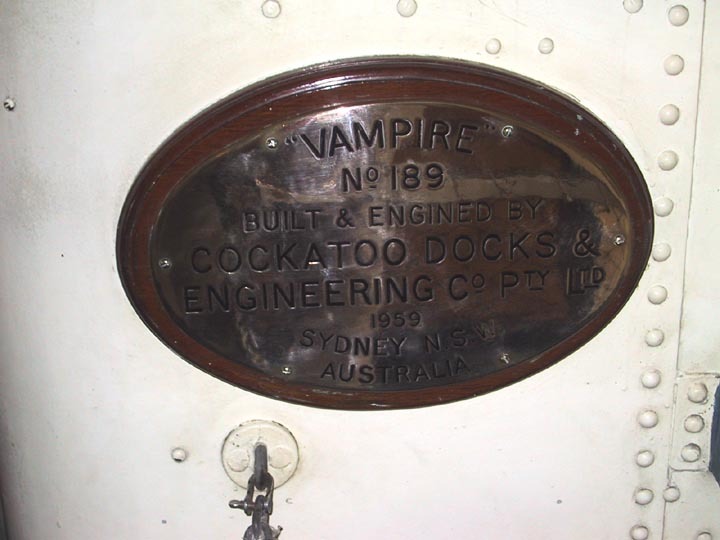 The plaque of the Vampire, showing its date and location of launching. 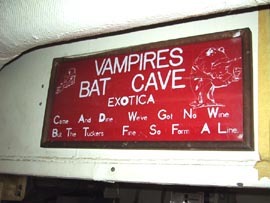 A covered over entry way into the machine room of the Vampire. 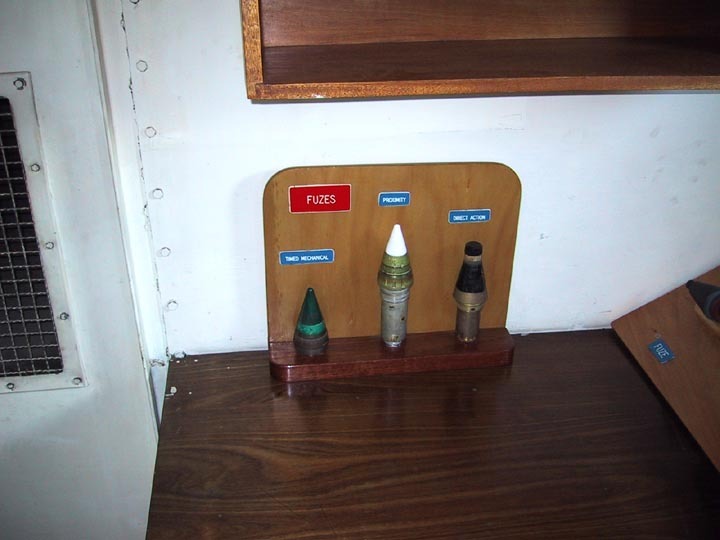 In the rear training room of Vampire are models of the 4.5 inch round fuses, showing timed, proximity and direct models. 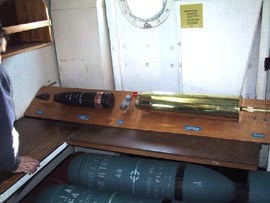 The complete 4.5 inch round assembly in the training room. 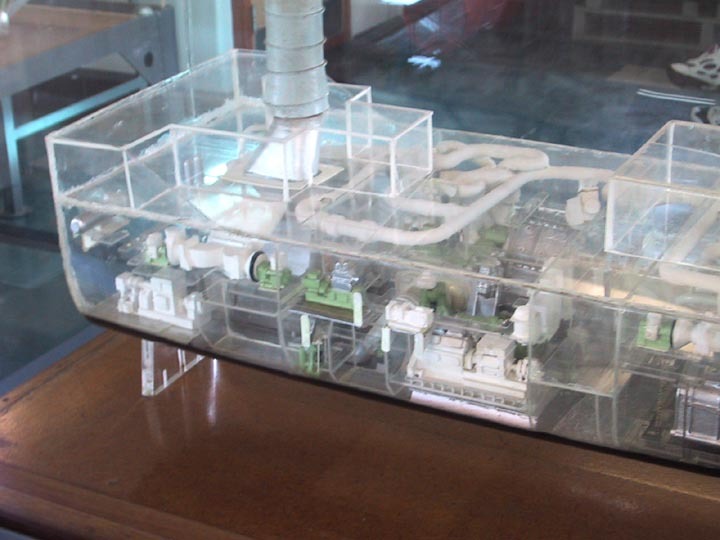 A model of the after portions of the Vampire, showing the Foster-Wheeler boilers and steam turbines that powered the Vampire to a maximum speed of 30.5 knots. 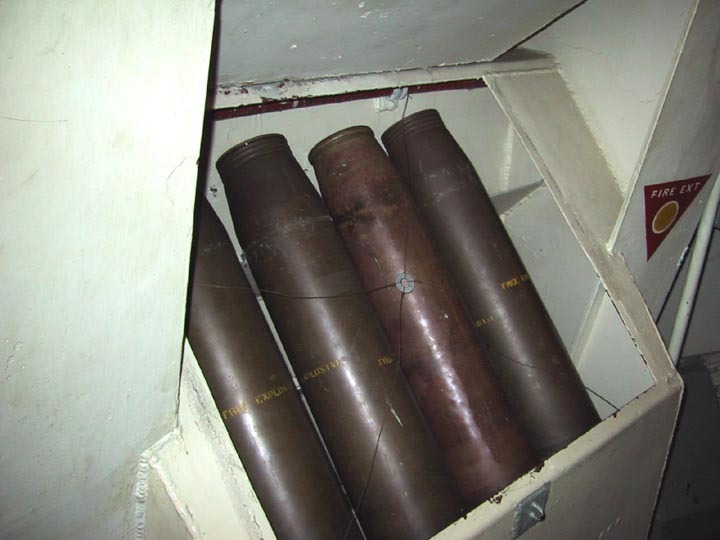 Anti-submarine "Limbo" mortar shells, once launched by a three-barreled Limbo launcher that sat where the training room the shells are resting in now exists. The Vampire never saw combat, although it participated in a number of actions, including escorting convoys during the Vietnam conflict. Ultimately, missile frigates have rendered her obsolete, and her mechanical systems became too expensive to operate - as a warship, she needed 300 crew, as a training vessel, 250. 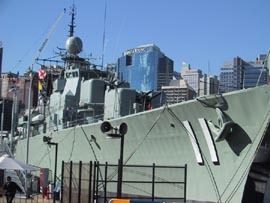 Modern missile frigates operate with fewer than 100 crew.